Simple, compound, and complex...learn all kinds of sentences with these interactive online exercises from Education.com. Complete and correct sentences are the key to good reports and essays later in life, so get your student started learning how to construct them right now with our online exercises. After they're finished here, more language arts learning awaits in our ELA exercise section. What happens when you put two subjects together in a sentence? You get a compound sentence! 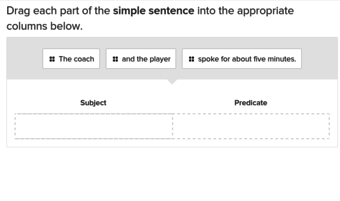 Compound sentences are the next step up from single-subject sentences, and there's even more after that -- they can be simple, compound, complex, and compound-complex. If that seems confusing, you're not alone: compound sentences are a tricky thing to master, and we have ways to work on them. For practise, try our compound sentences exercises and get to work on complex and simple while you're at it. We have several ways to try them, from drag-and-drop clauses to multiple-choice answers. They won't take long to do, and they'll help sharpen your student's language skills in no time. Once they're done with these, they can challenge themselves with another "compound" concept: Compound words. All of our exercises have been developed by education experts, so you can feel good about what your kid is learning from them, too.